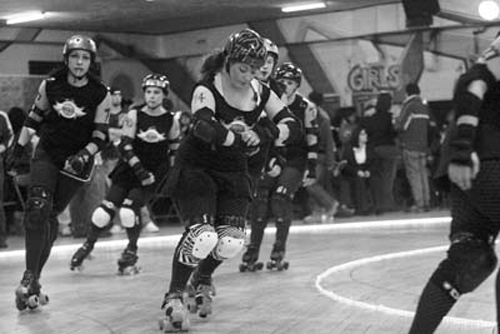 Getting excited to go to the double header Rochester Roller Derby Saturday night. I just found out that not only does it benefit The Animal Services League and GRASP, Greece Residents Assisting Stray Pets but I found out that if you bring a can of pet food to donate at the door, you will get a raffle ticket for a chance to win cool prices at halftime. I have been thinking a lot about what my name would be if I were in a roller derby. Jennocide? (no, bad connotations) Scarlett O'Terror? (drat, taken) Helen Killer? (band name), Betty Cracker?, Martha Stew Hurt? I dunno. Gotta keep thinking. Bwahaha! Martha Stew Hurt! That's the best! Oh Jenny, you crack me up! ha. I like Betty Crack Her and the Martha one! Cute. Can't wait for those pics.